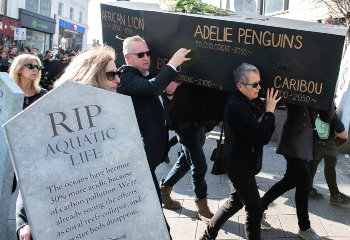 Several hundred local people from Extinction Rebellion held a funeral for life on Earth in central Brighton, at the weekend – to sound the alarm about the looming threat of human and other species extinction, as a result climate breakdown. The funeral procession was led by a piper sounding a lament and included a celebrant, mourners and a coffin – to symbolise the bleak future for all living things, if urgent collective action is not taken to mitigate the worst effects of the climate crisis. There were 11 mourners wearing black veils following the coffin, symbolising the 11 years we have left to act on climate catastrophe – according to the Intergovernmental Panel on Climate Change's landmark report. The gathered mourners shared poems and thoughts, in which they expressed their grief about what is happening to the natural world – as well as their hopes that the rising tide of environmental activism may force those in power to act. "We are the first generation of human beings to fully grasp the extent of our impacts – and the last generation of human beings with the power to change them. "Those of us listening to the scientists can see where we are currently headed: towards our own imminent extinction. "Time is running out, but it's not too late. We have the technology to stop climate change spiralling out of control. "The problem is that governments around the world, ours included, lack the political will to act. "We demand they treat it as the unprecedented global emergency it is – so this generation can leave behind a world fit for those to come." Extinction Rebellion Brighton is a group of local mothers, fathers, grand-parents, teachers, doctors, business owners, academics, creative industry workers, jobseekers, artists and students, all united by a common concern about the lack of government action on the climate crisis. The group is committed to taking non-violent direct action to force the government to put the climate crisis at the top of its agenda. It wants the government and the media to tell the truth about the climate crisis, for the UK to become carbon neutral by 2025 and a citizens" assembly to be set up to oversee the necessary, urgent changes. Part of a rapidly growing global movement, the Brighton and Hove arm of Extinction Rebellion was set up in November and is increasing in numbers daily. Many of its members will be taking part in Extinction Rebellion's International Rebellion from the 15th April, when capital cities around the world, including London, will be brought to a standstill.